became a professional pianist at age 14. His styles include	classical, jazz, swing, Latin, & new age. His specialty is the great Sinatra songbook - the well known standards of 1930-1970. Kim has performed in many of Portland's finest restaurants, with extended engagements in the Benson and Hilton Hotels lobbies. He played nightly for seven years at The Grand Cafe when it was a fine restaurant. Kim often plays at Timberline Lodge, Lakeside Gardens, and the Oswego Lake Country Club. 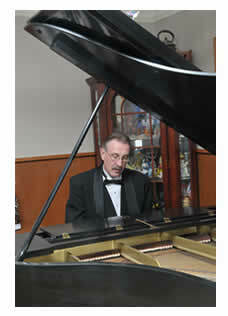 For 20 years he has played for Easter Sunday and Mother's Day at the Waverley Country Club. A very authentic sounding electric piano is available, with microphones and a sound system, for inside or out. Requests are welcomed, just ask. Classical piano samples can be heard on our Ceremony Page.